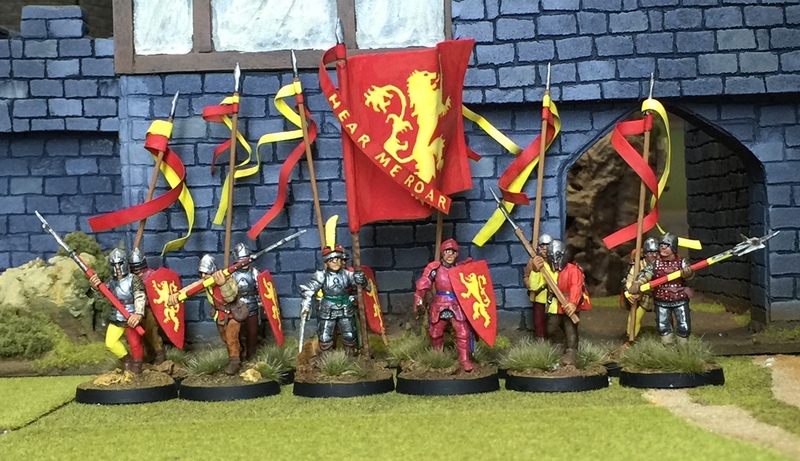 Here you will find my Lannister army. 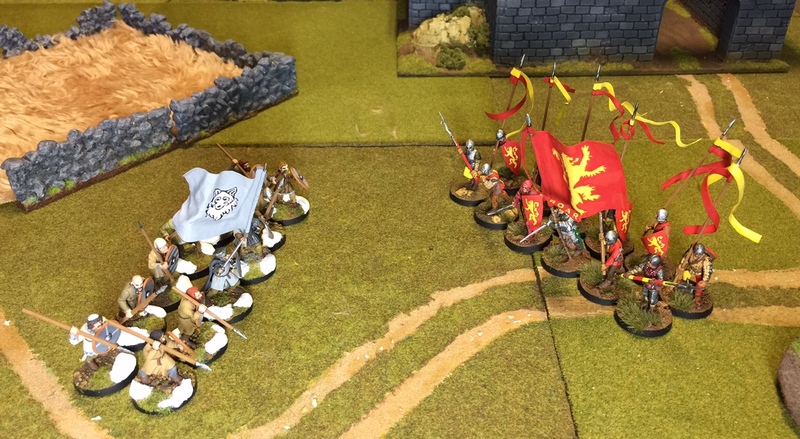 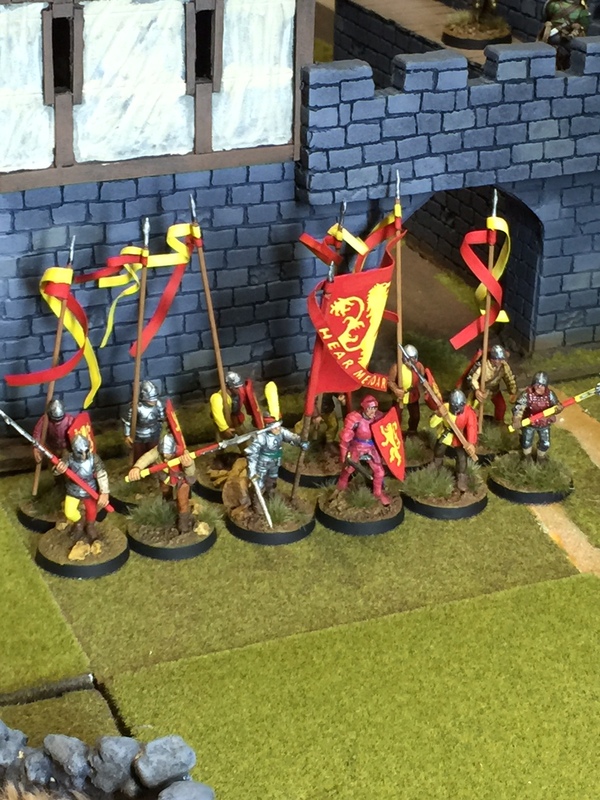 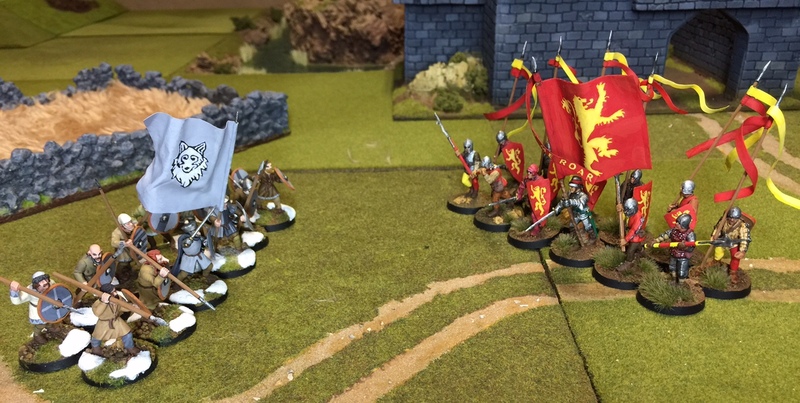 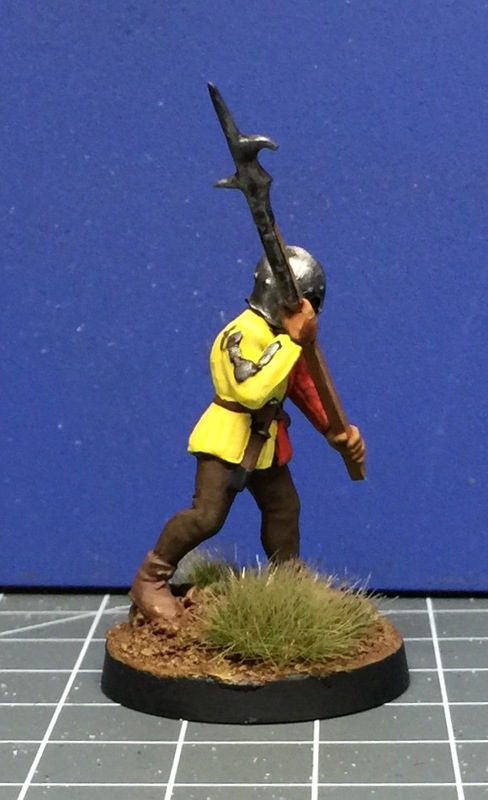 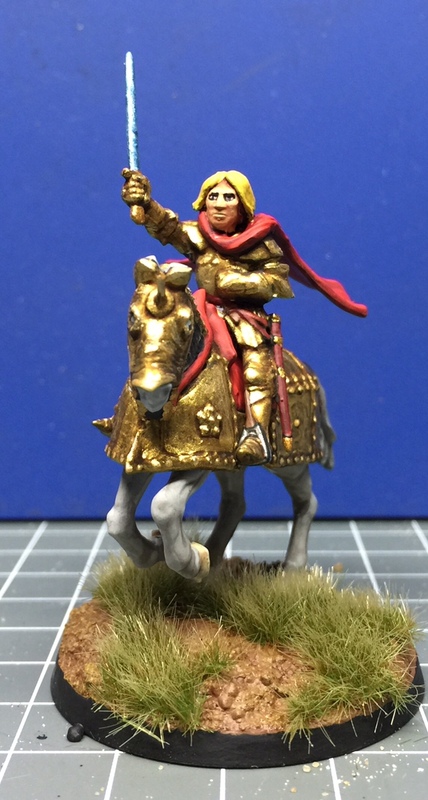 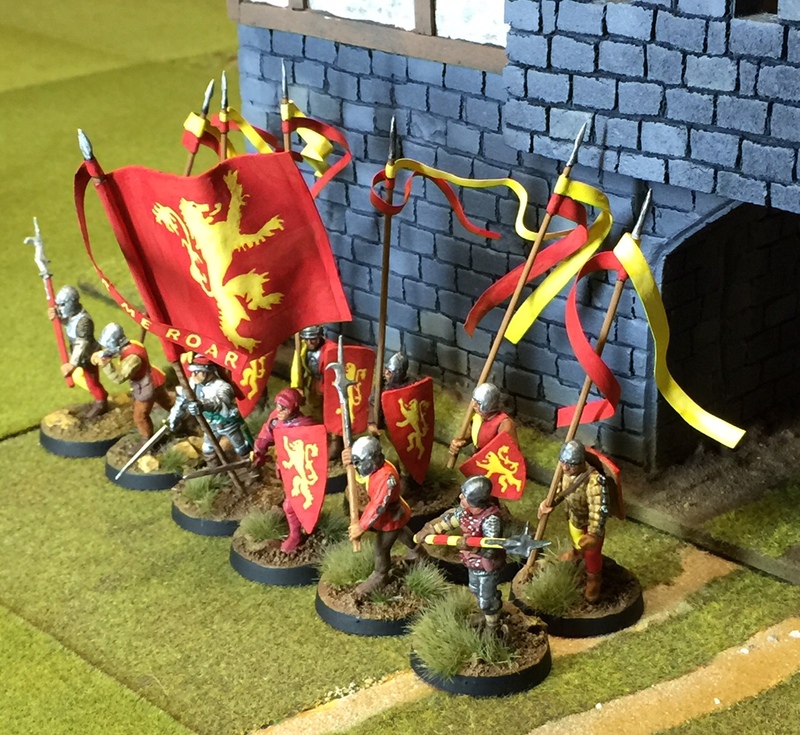 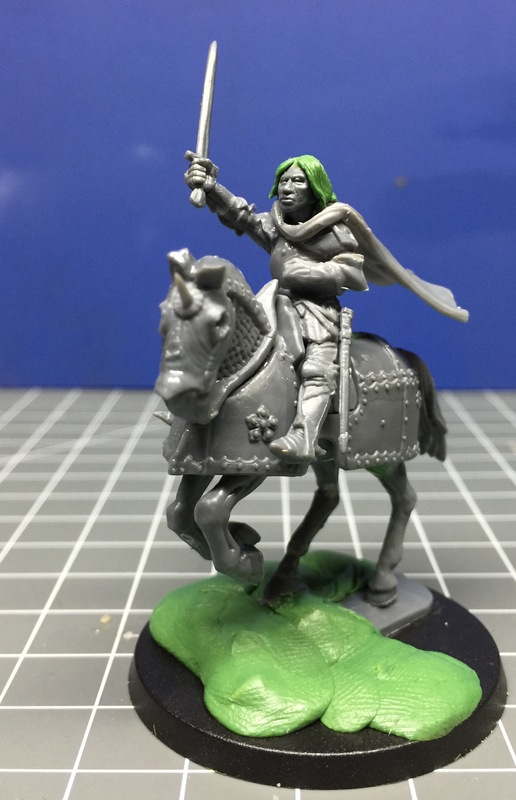 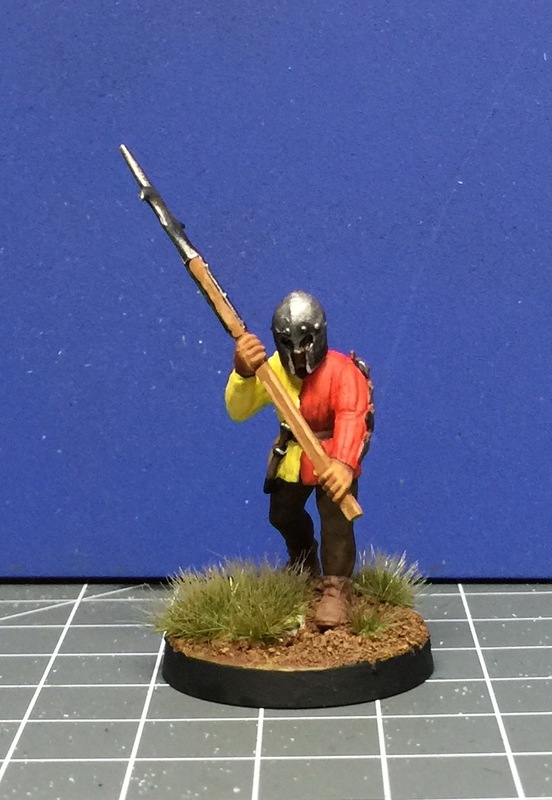 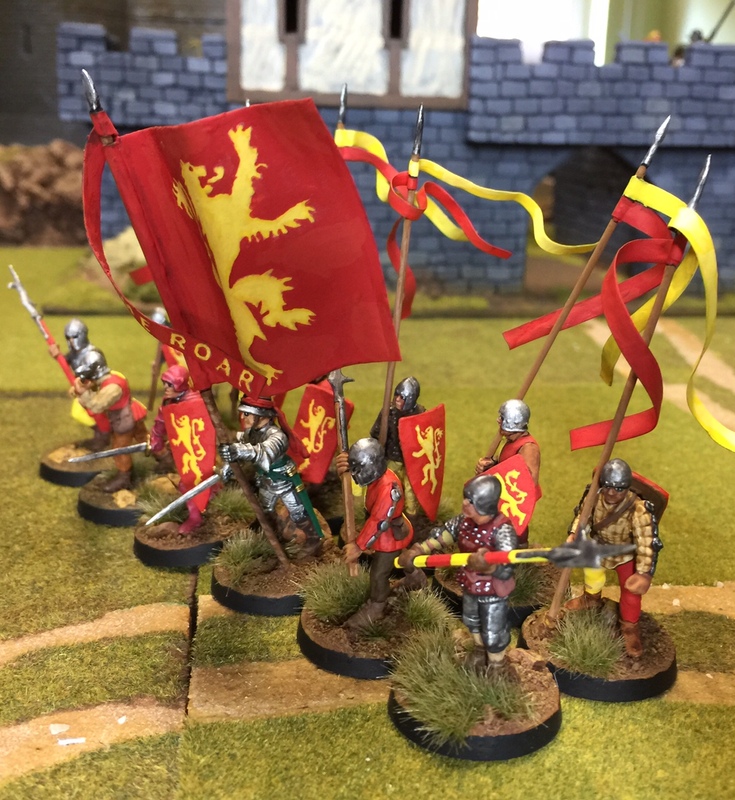 I changed the rules system I use for gaming in the GoT universe to Lion Rampant . 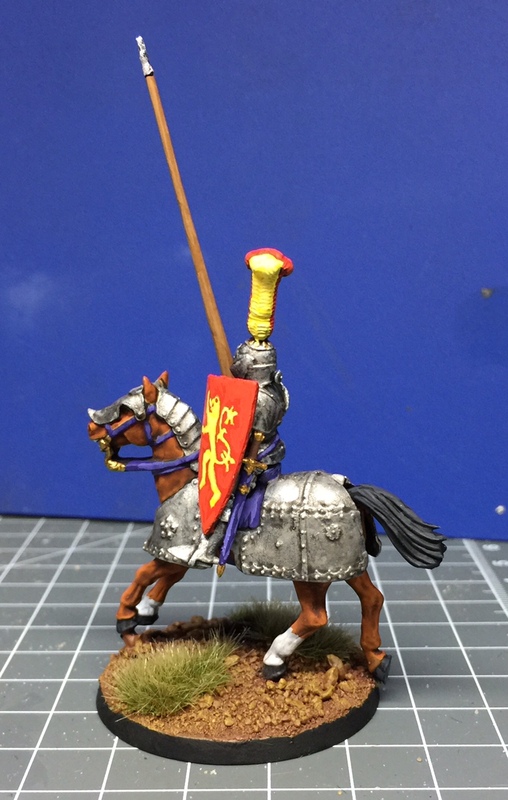 Soon to be changed into Dragon Rampant. 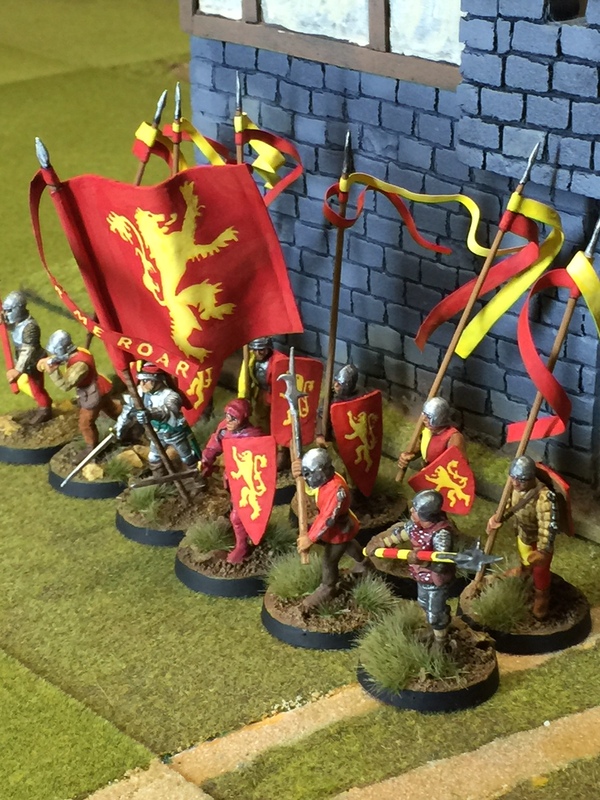 You can find out more about these rules systems here. 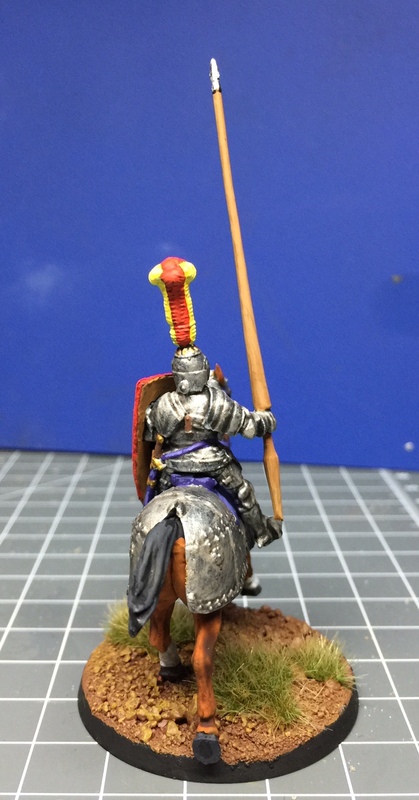 This is the last of the heavy knights. 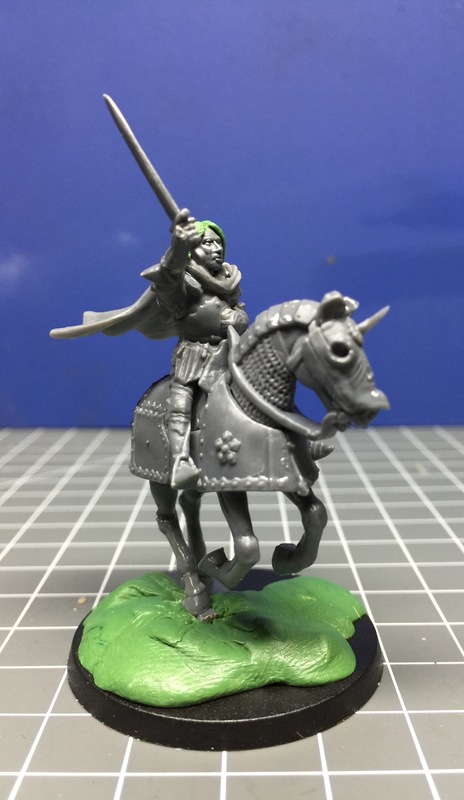 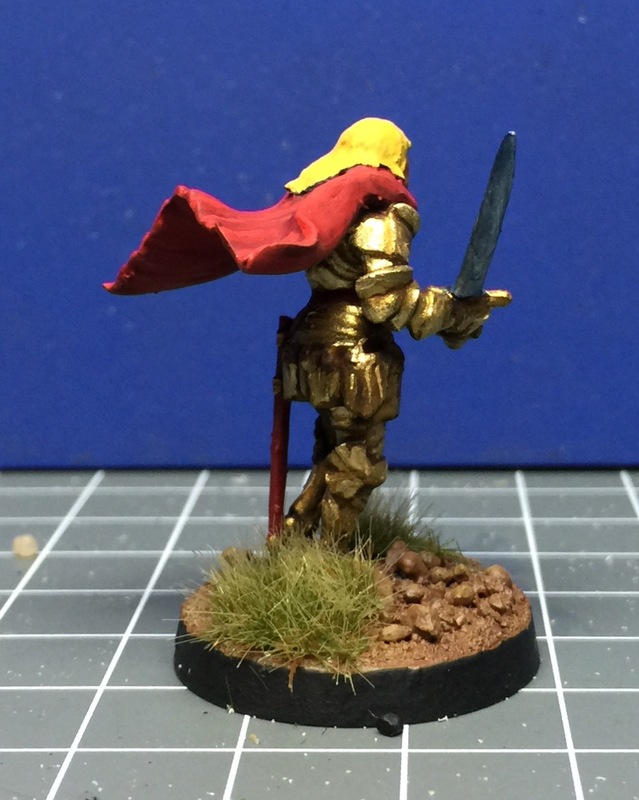 When Dragon Rampant comes out I will do another one as the Jamie figure then can be used without an attached unit. 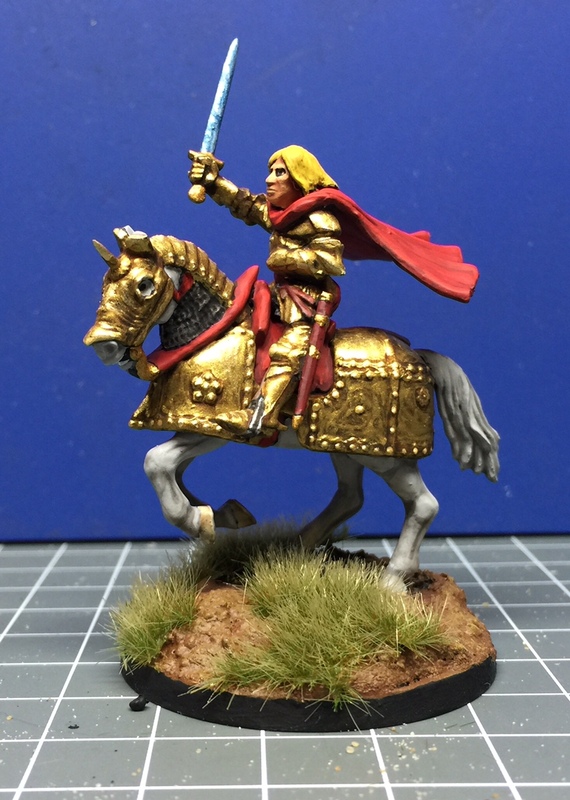 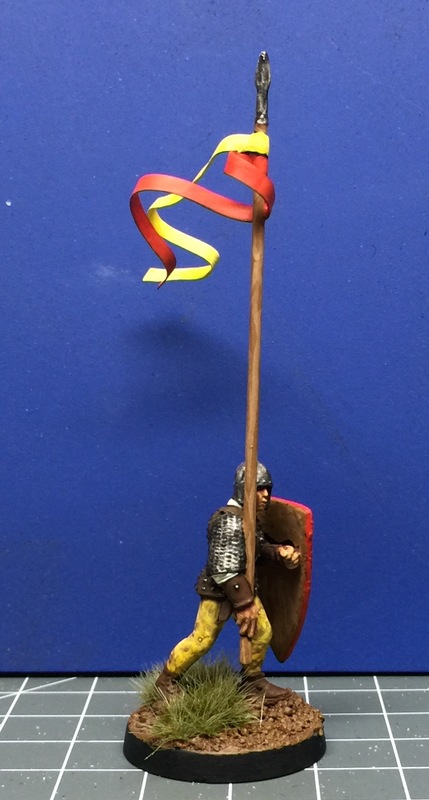 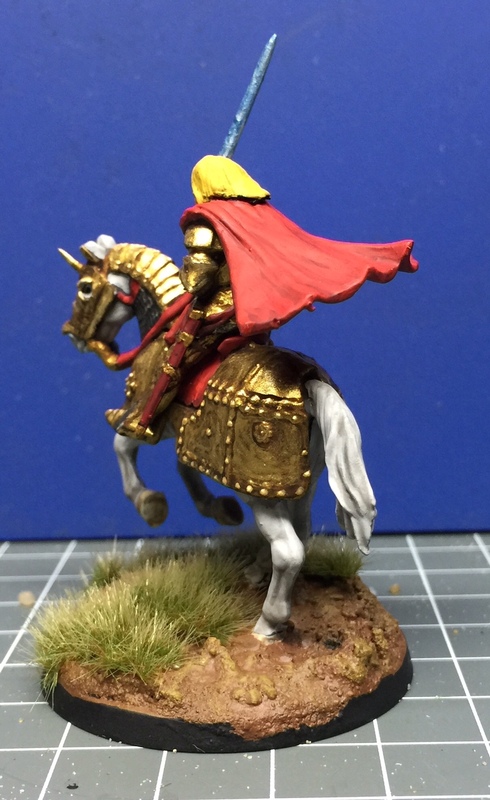 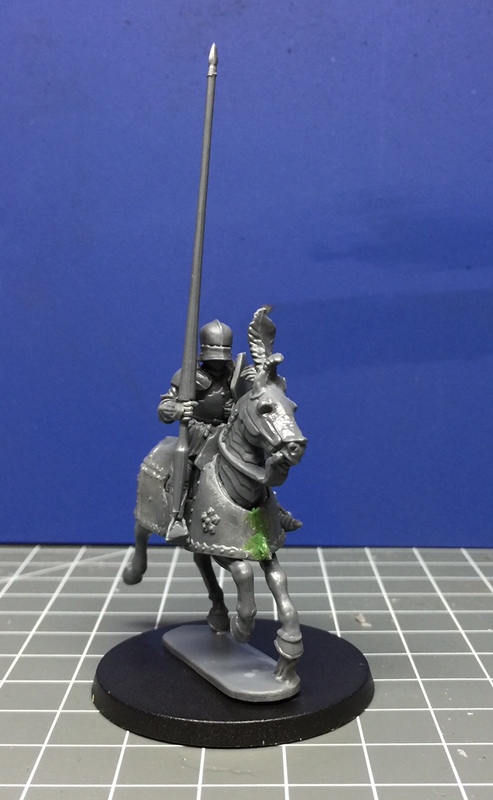 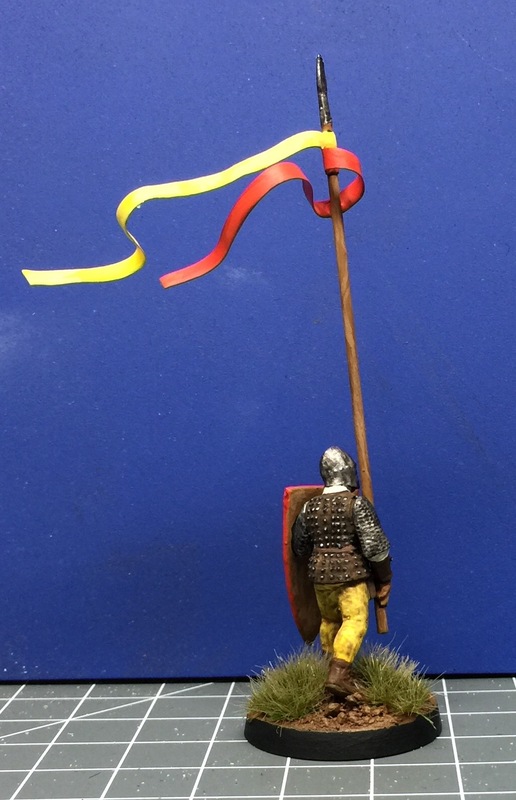 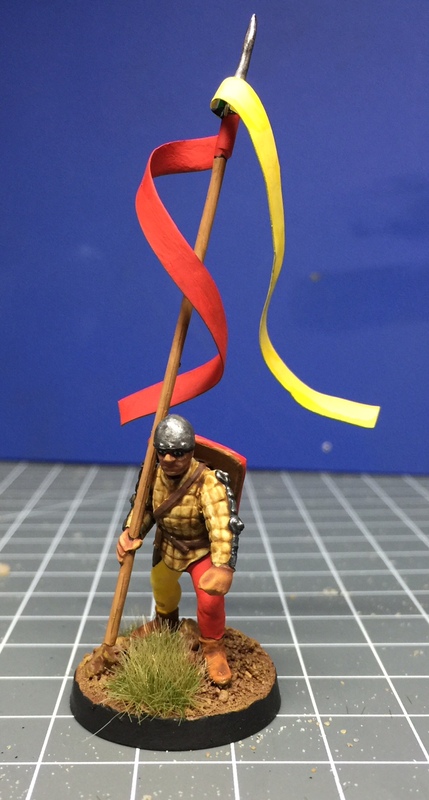 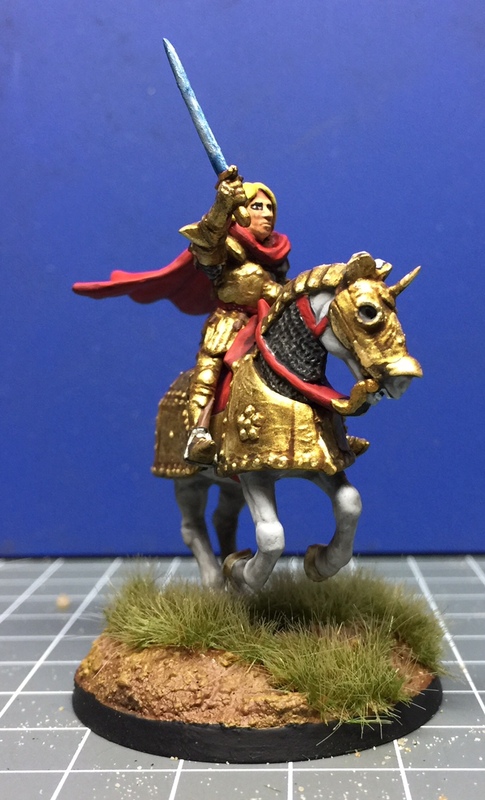 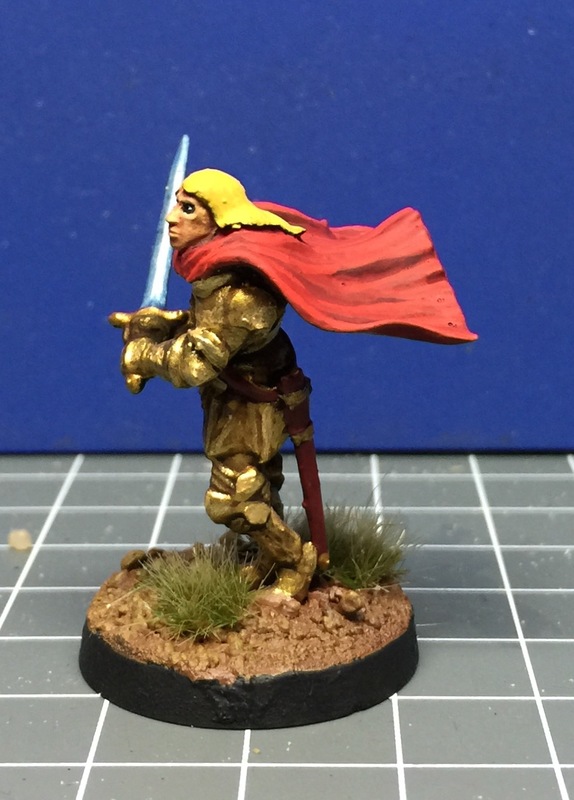 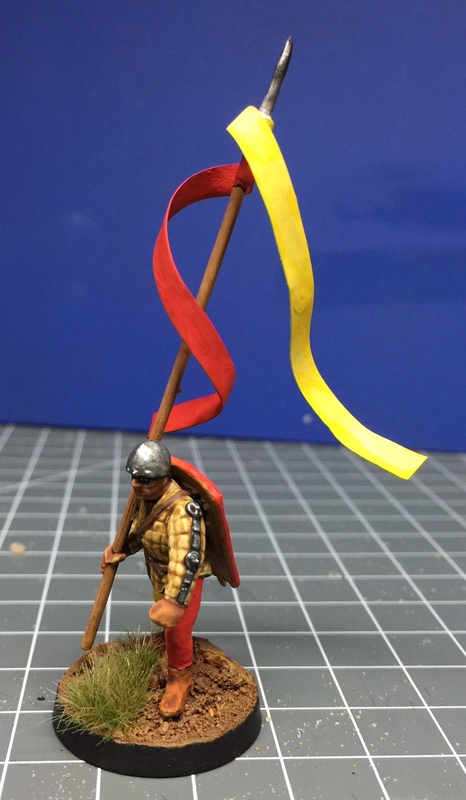 The Lannister heavy knights banner bearer. 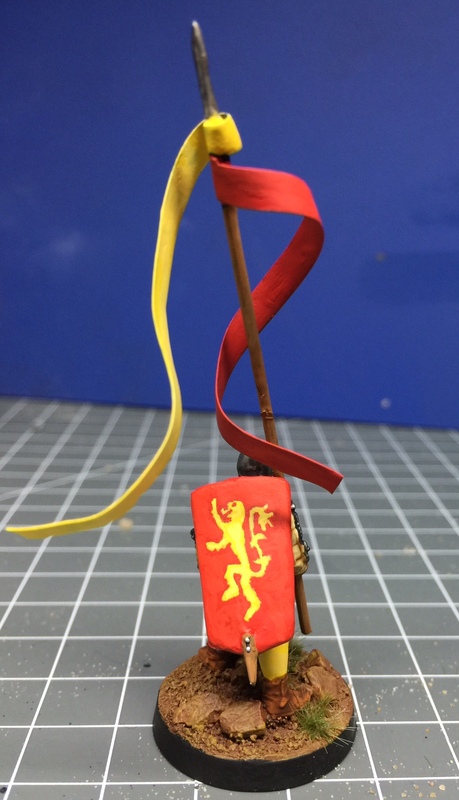 I gave him a banner with a gold colored lion instead of the usual yellow one as Jaime is famous for his golden armour and I wanted to have a different banner for his personal banner bearer in comparison to the usual Lannister banners I have in my army. 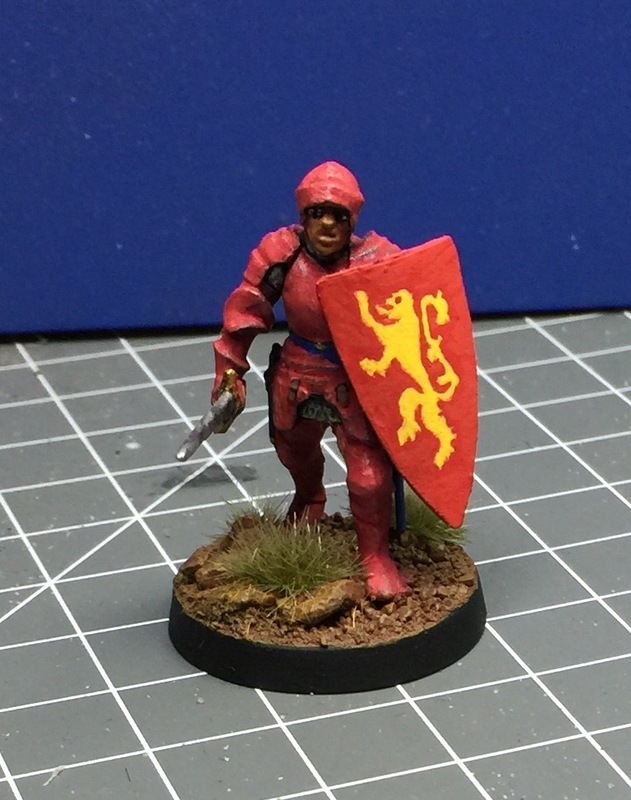 And another member of the Lannister family! 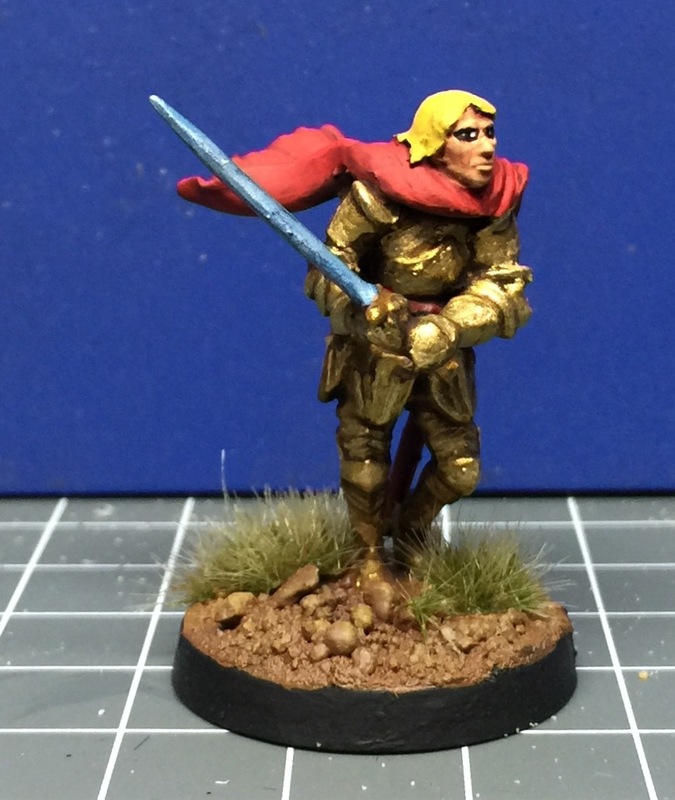 I forgot to post pictures of the leader of the foot sergeants unit. 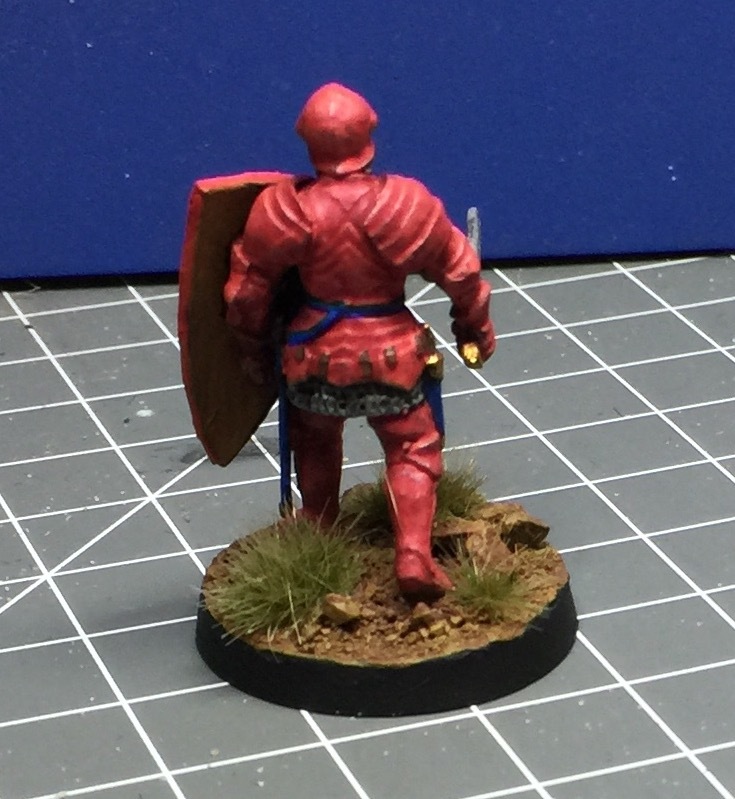 I tried to paint him in red armour. 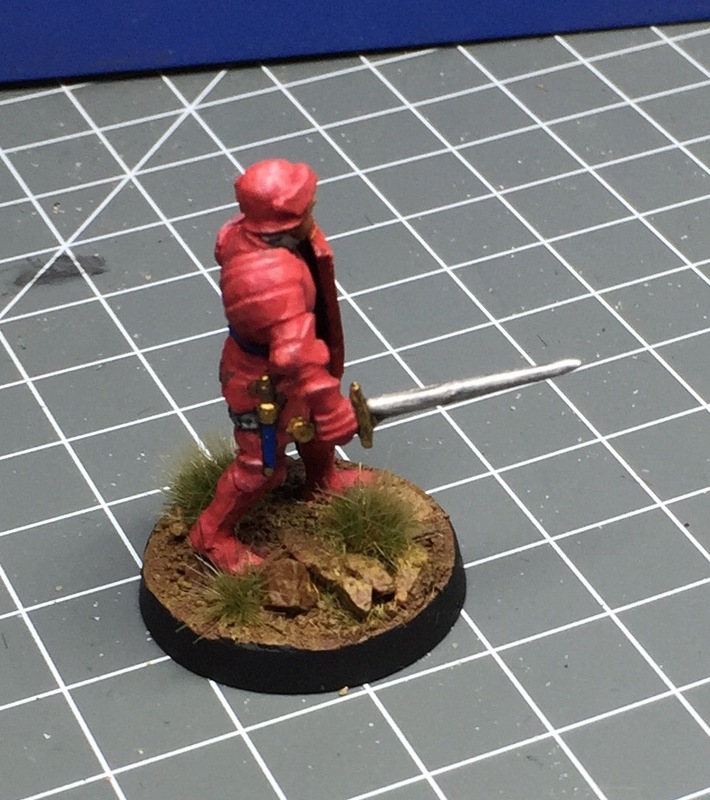 Do you think the red armor works? 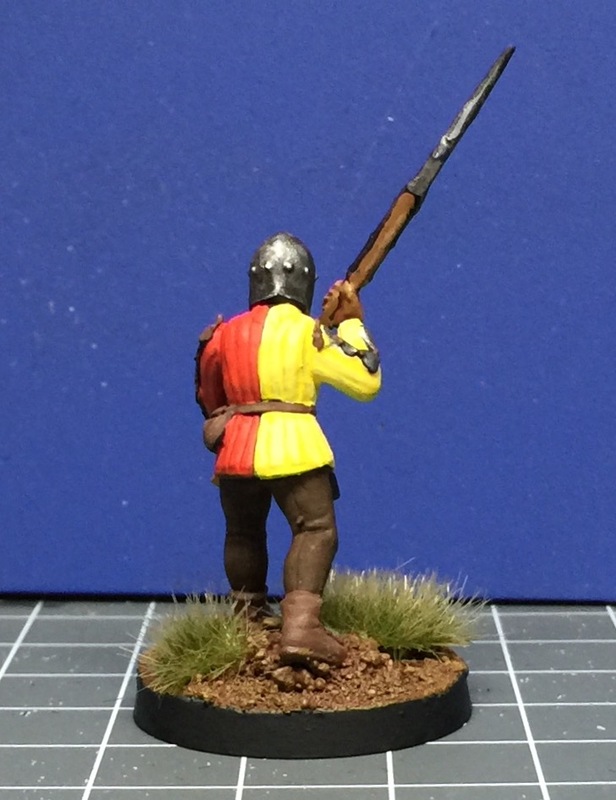 And the last Sergeant for this unit!!! 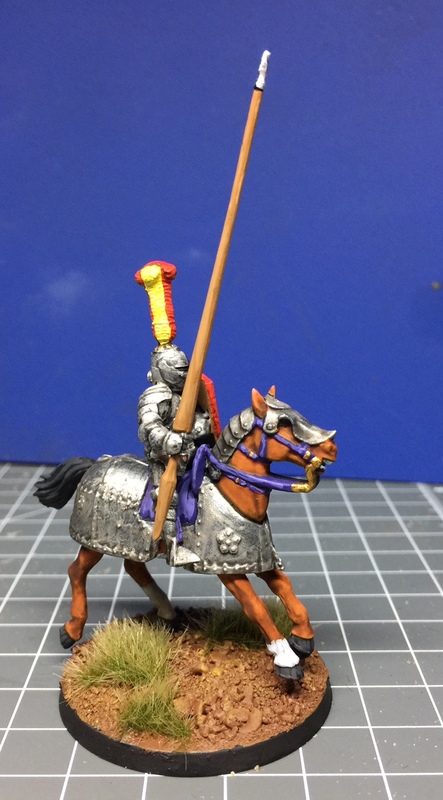 At last I managed to finish this unit. 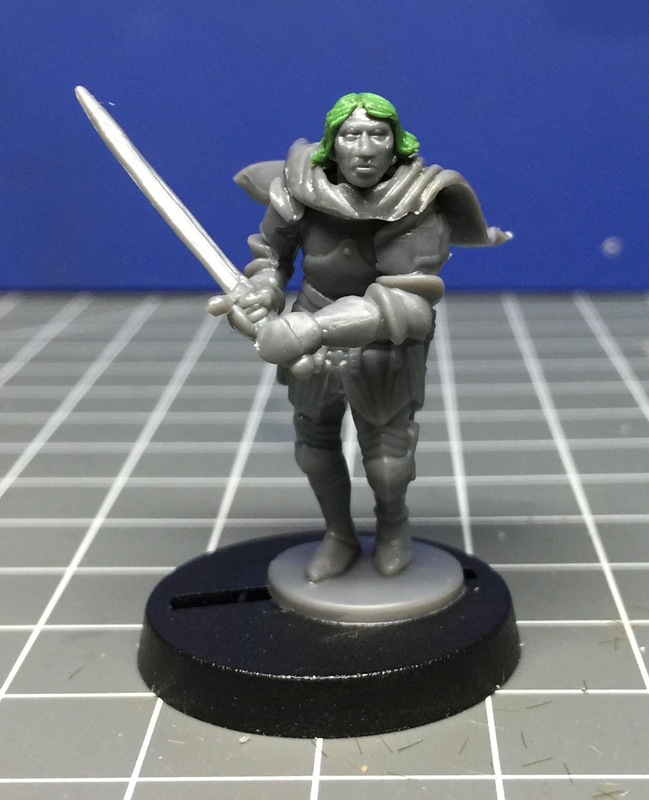 I hope the next one will be quicker. 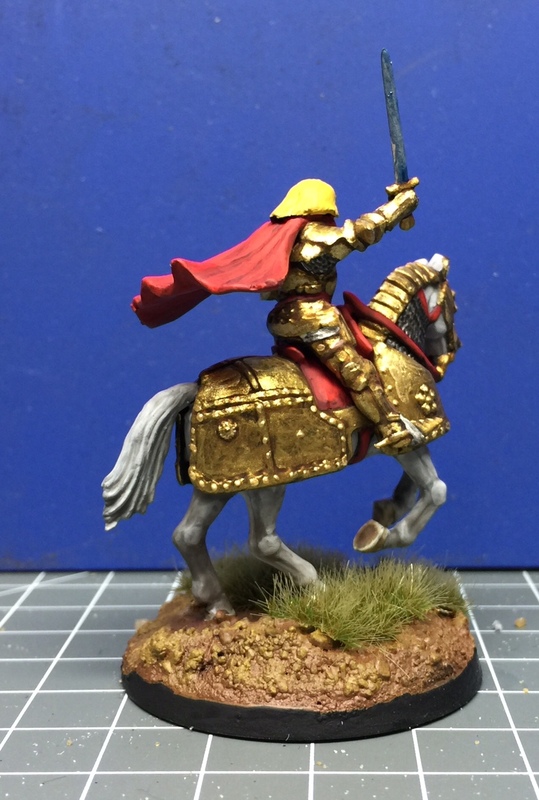 I will take some pictures of the completed unit next. 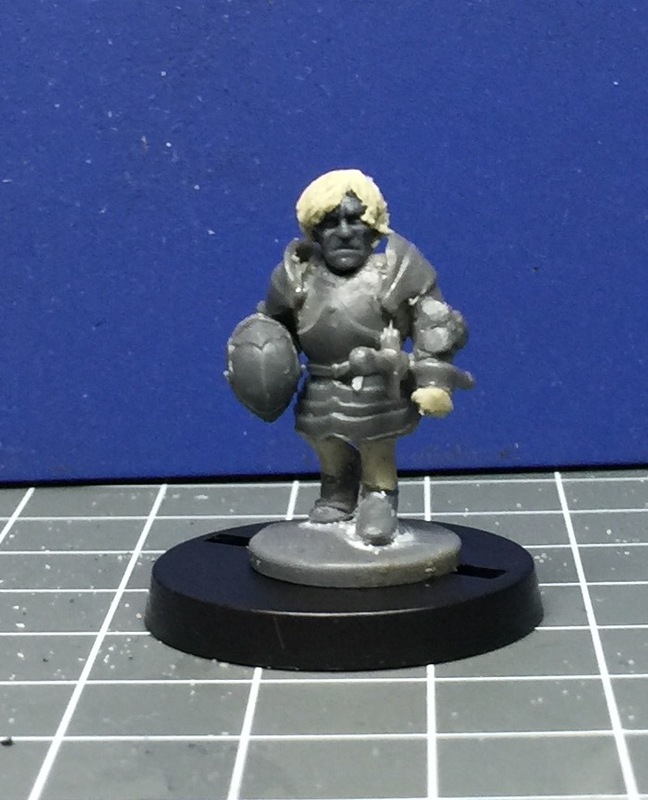 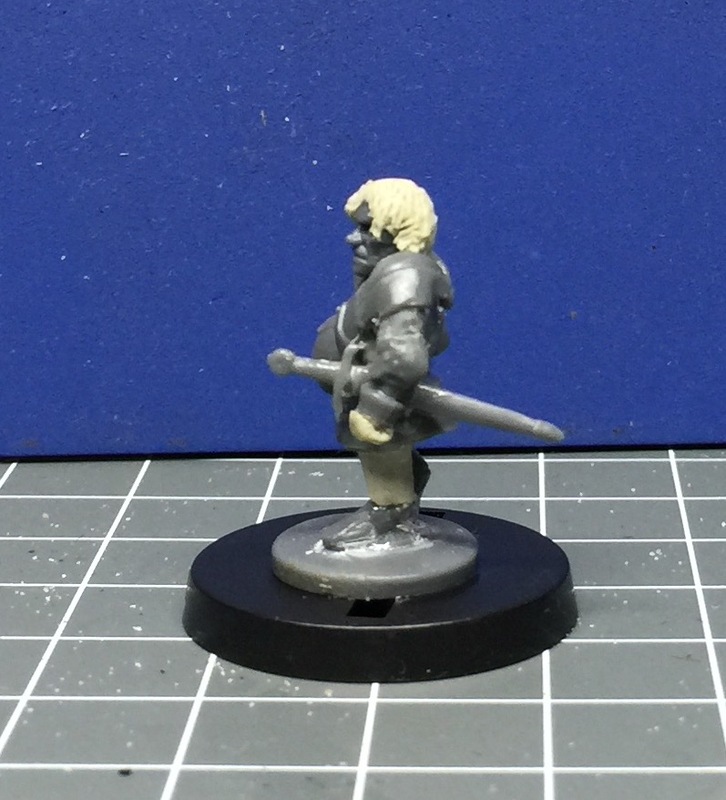 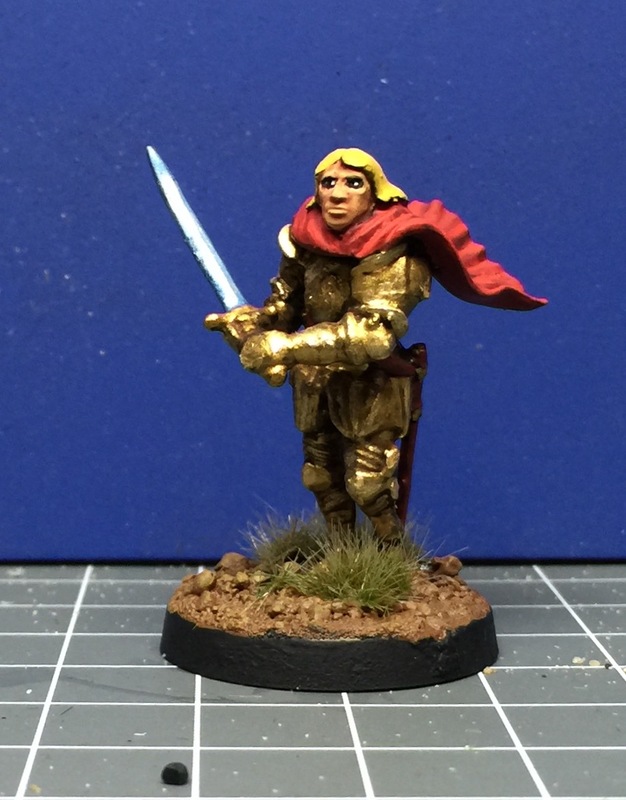 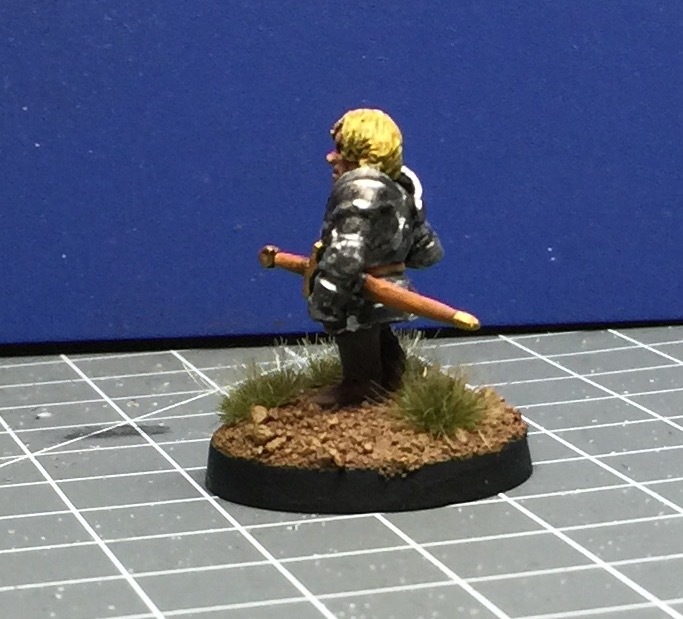 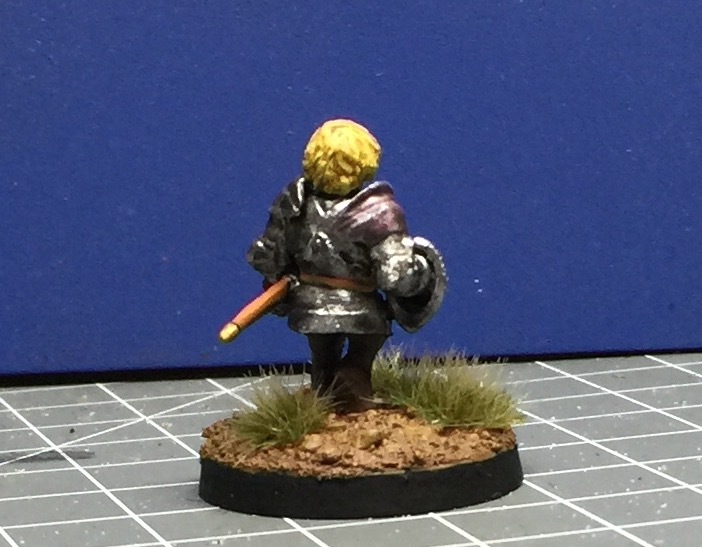 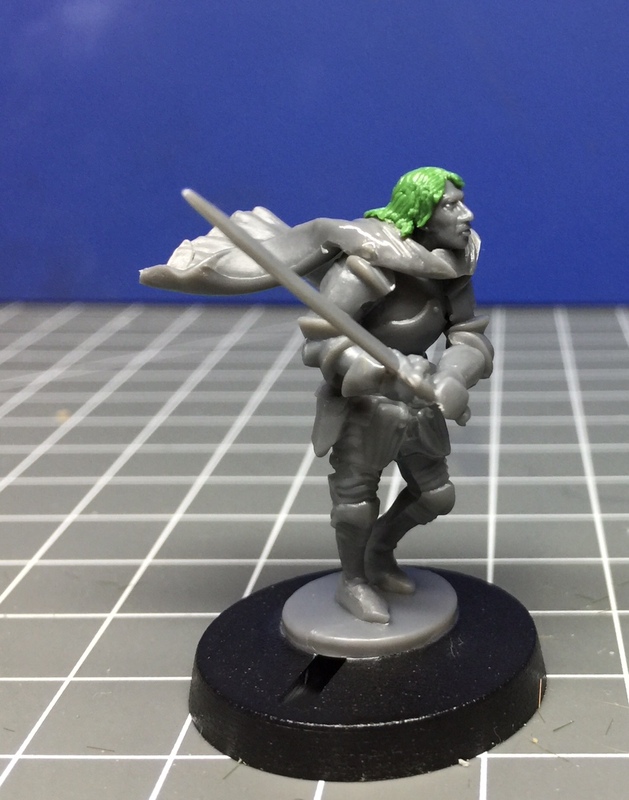 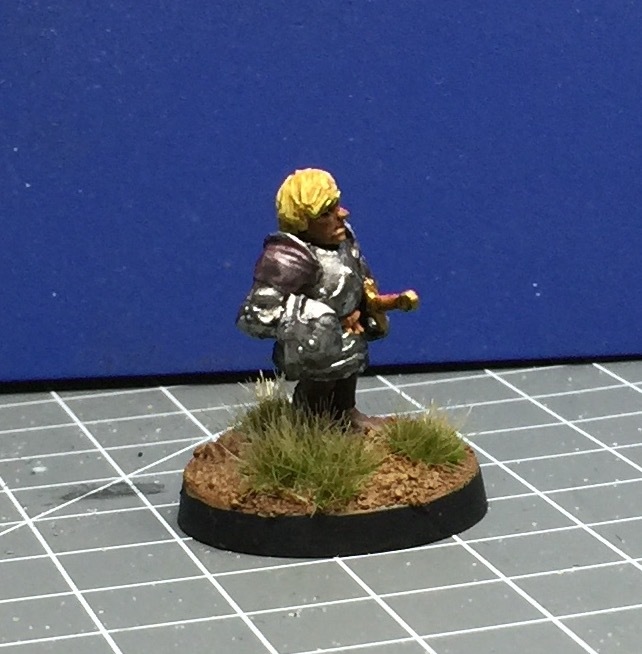 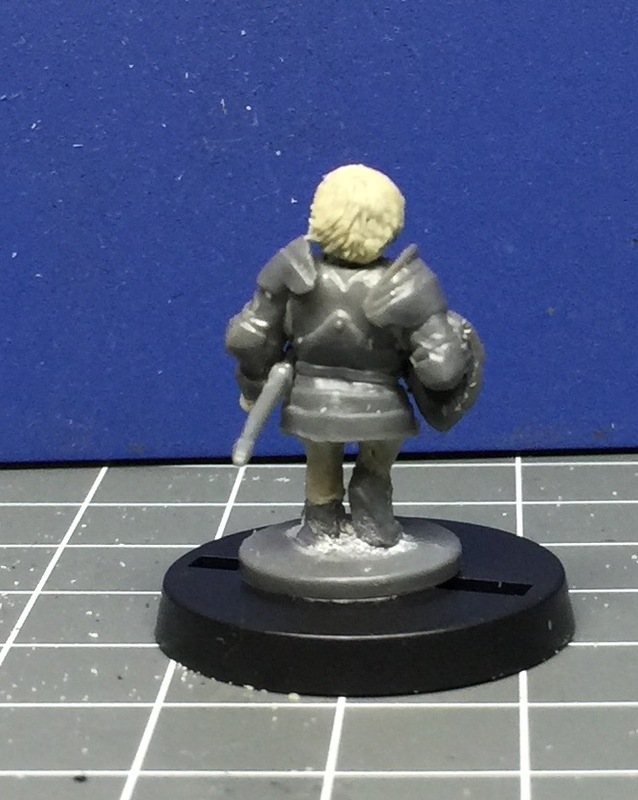 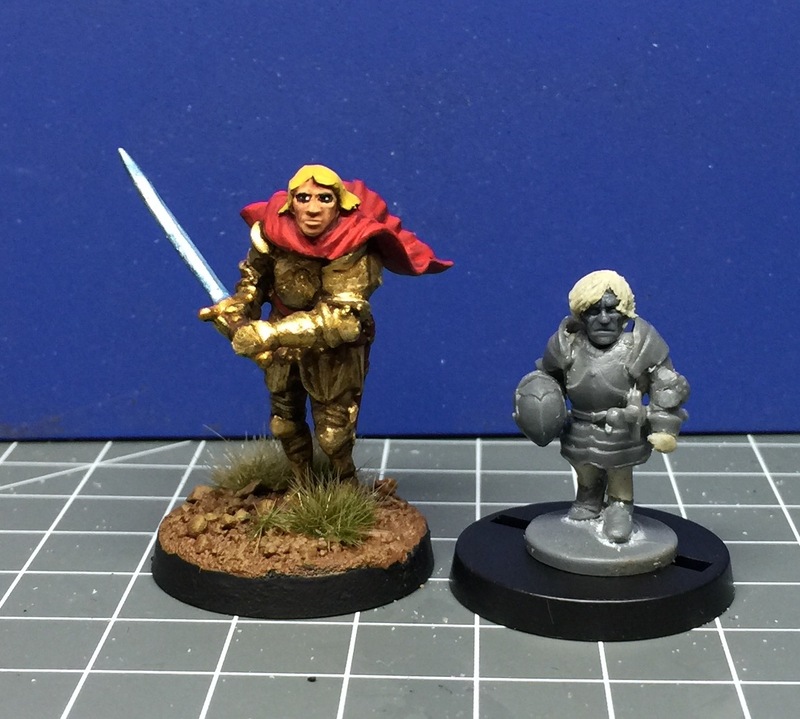 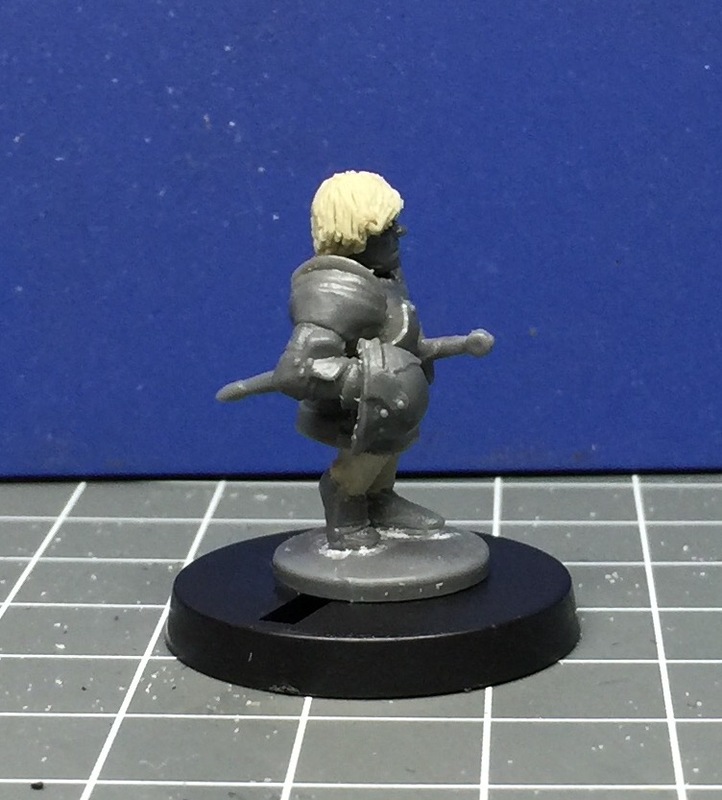 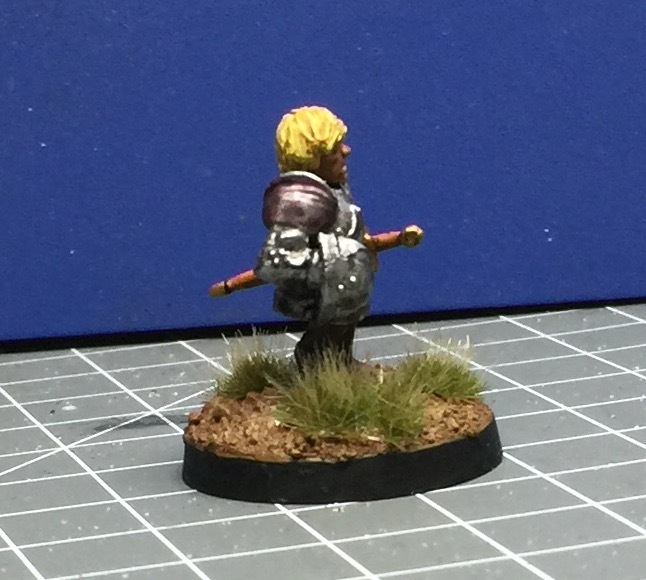 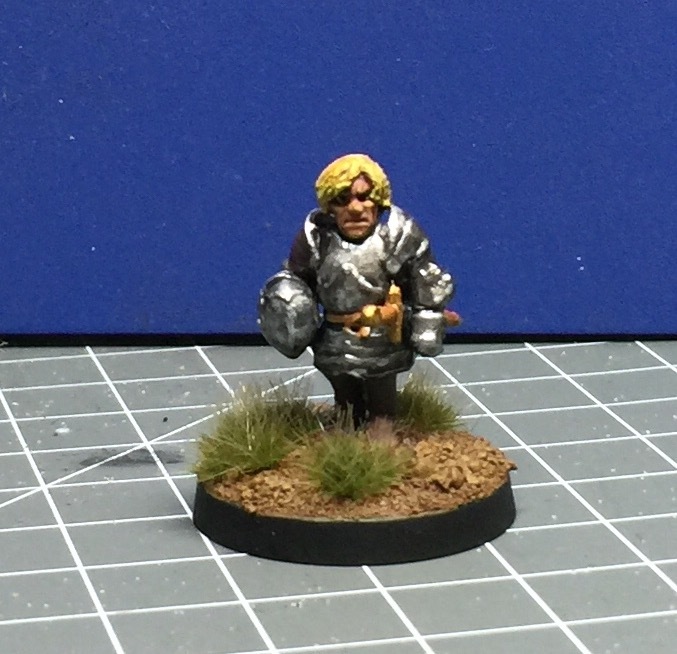 Here are more pictures of the Tyrion Lannister Conversion my Son did . 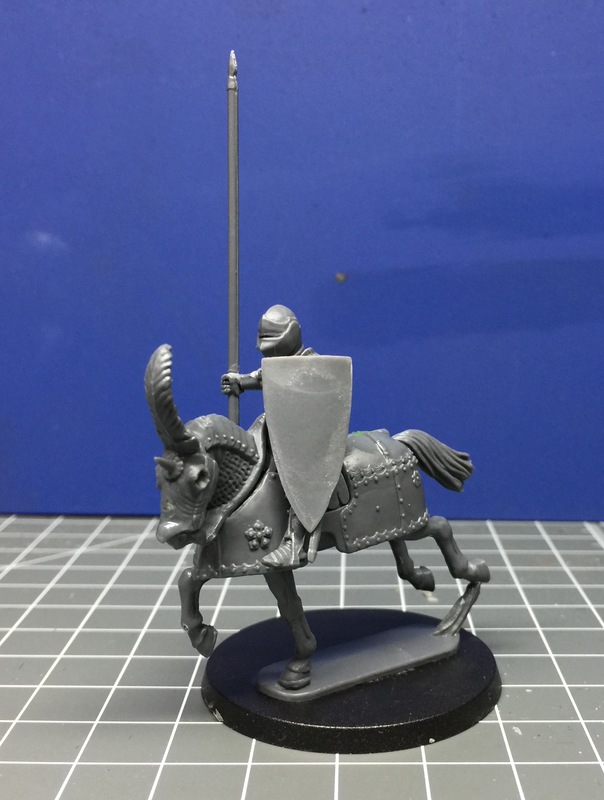 It will be painted by me shortly. 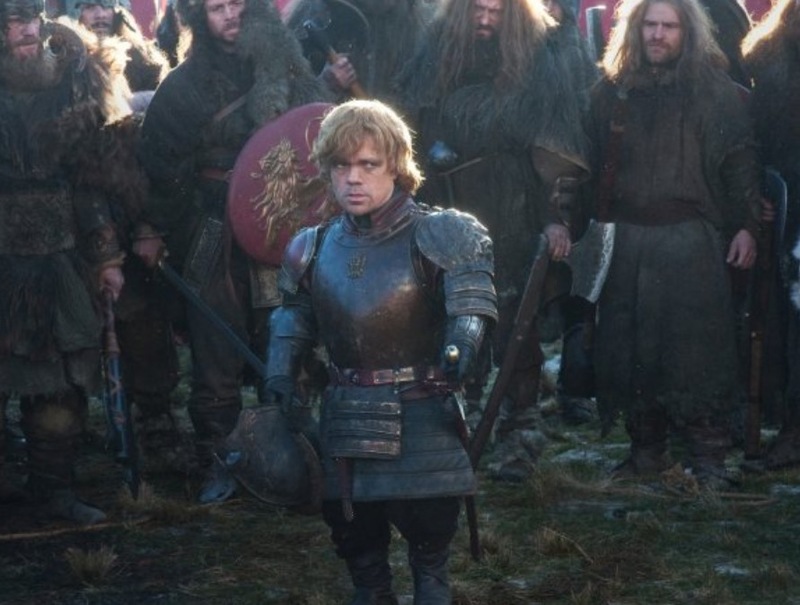 And a comparison shot with Jaime Lannister to show how short he is. 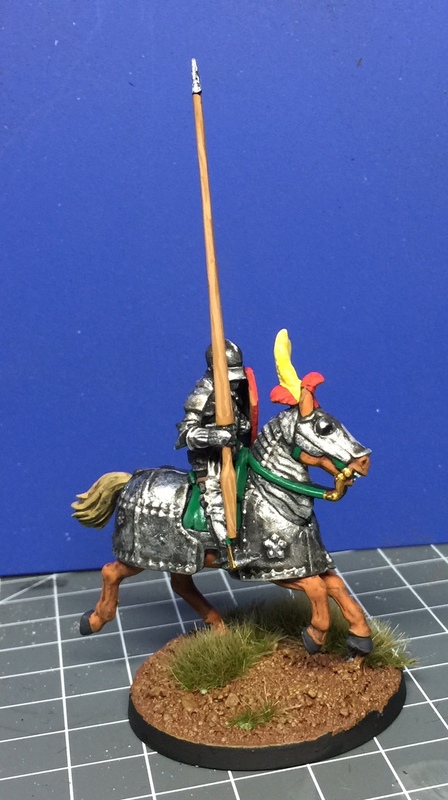 Here is the first of Jaime Lannisters bodyguard heavy knights. 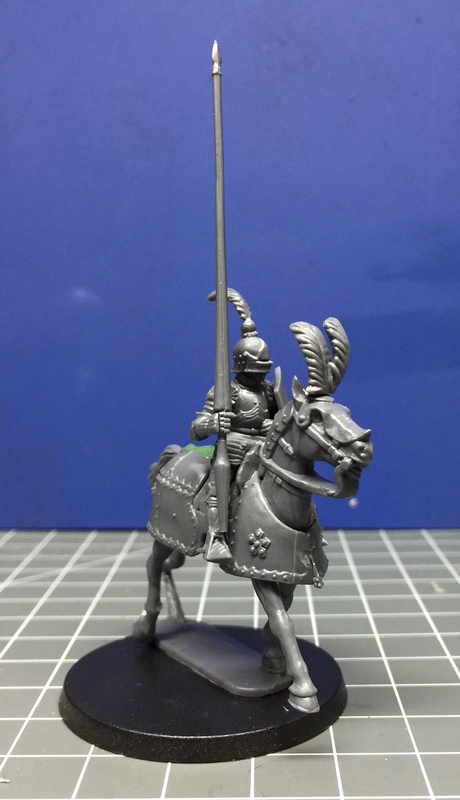 It is a strait build out of the Perry box mounted knights of the war of the roses. 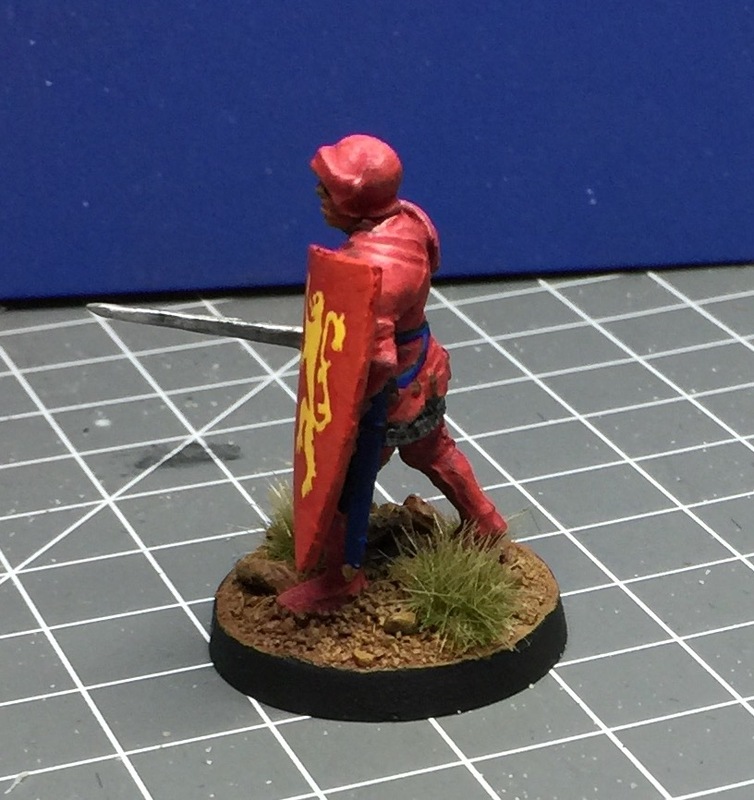 I only added a shield (by Fireforge). 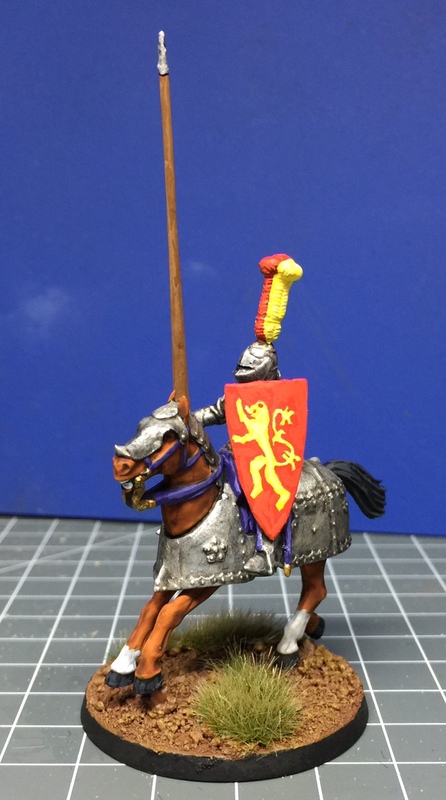 The heraldry is freehand as usual. 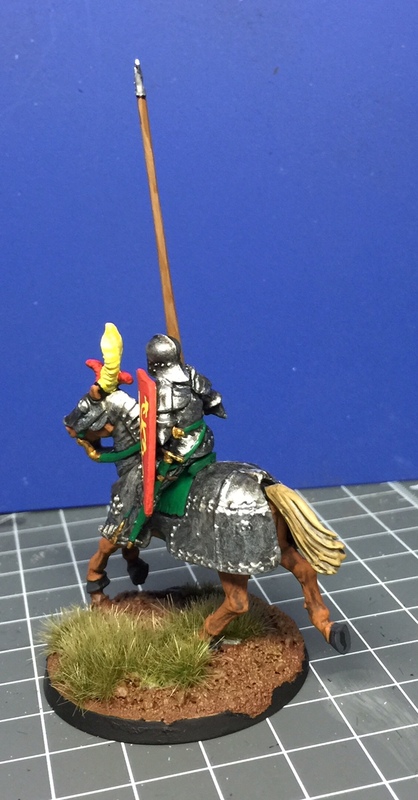 First the figure on horseback. 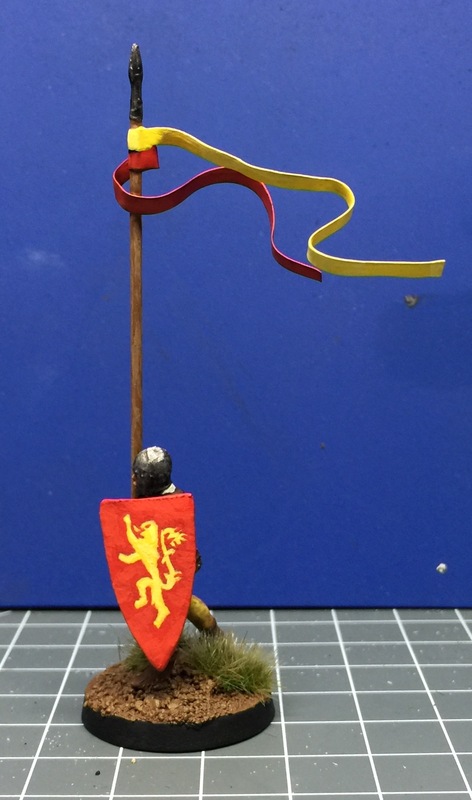 I painted the sword in a blue steel color to represent Valyrian steel. 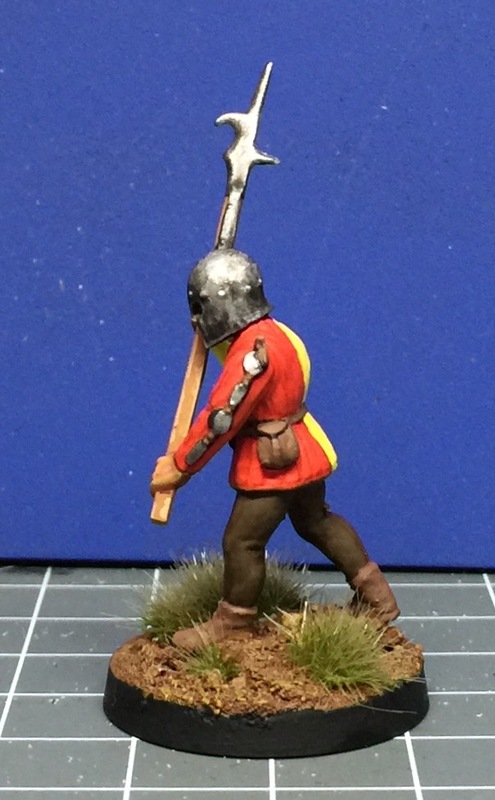 Next will be another sergeant from the soon finished sergeants unit. 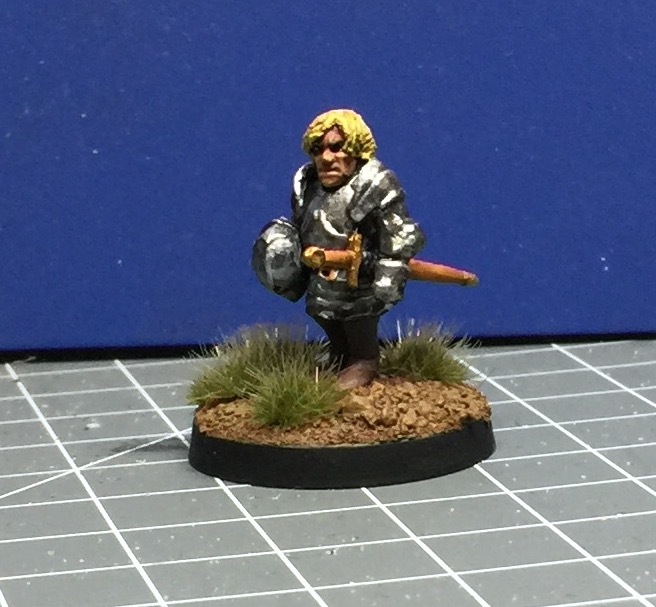 Then the first of Jamies bodyguard. 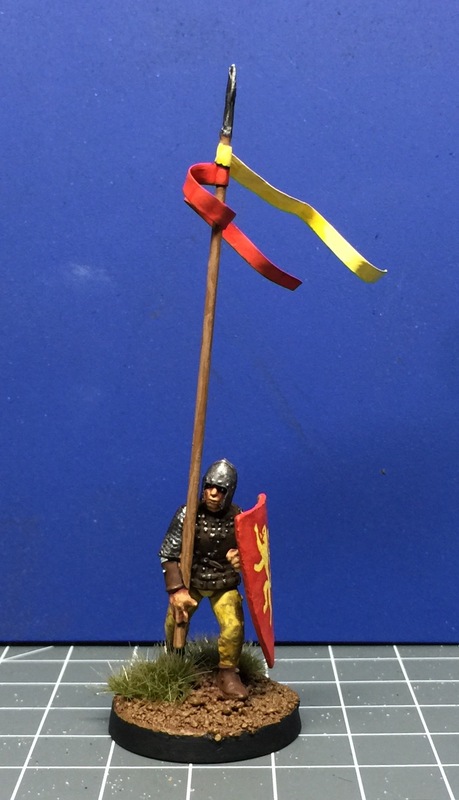 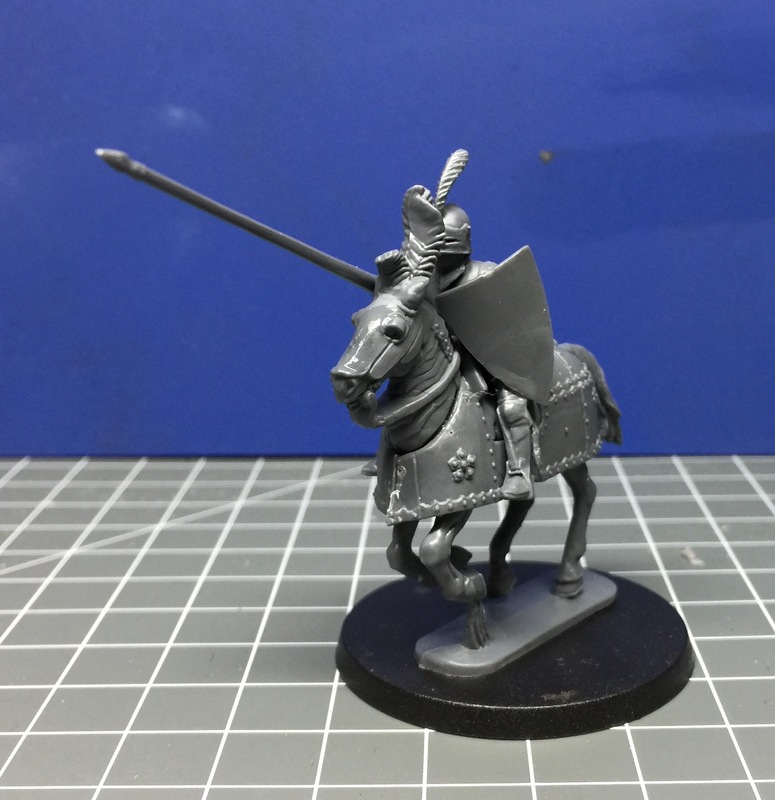 As you can find elsewhere on Wargamesgazette I started on a Lannister sergeants unit a wile ago I will post pictures of the completed unit here as soon as I am finished painting them. 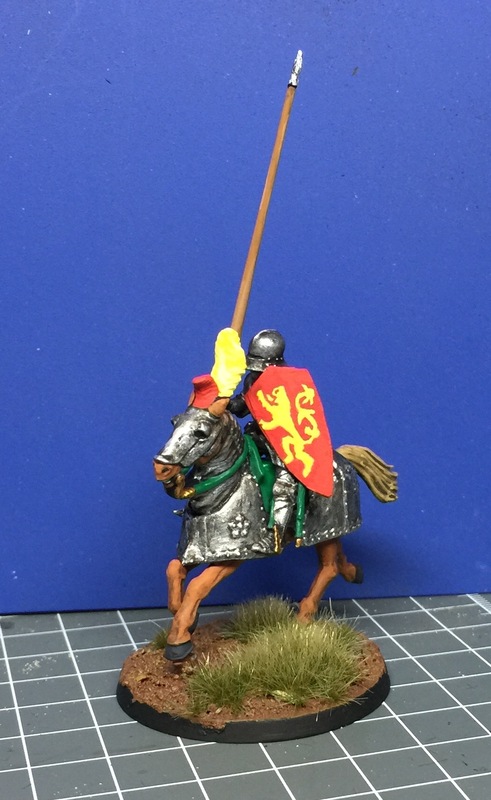 Here you see pictures of my Jaime Lannister figure on horseback and on foot. 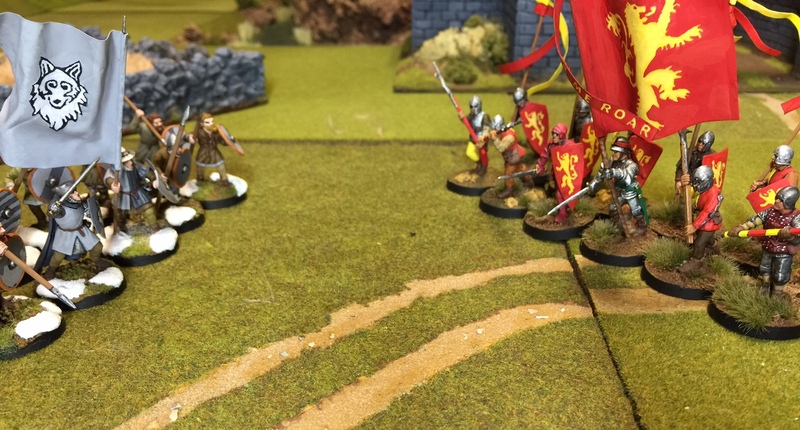 Accompanied by his heavy household knights. 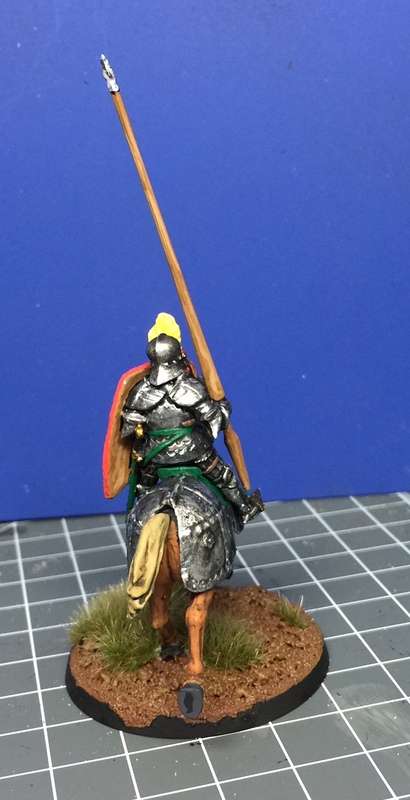 I gave them shields to make them into a little bit more fantasy like knights ( The shields are from Fireforge). 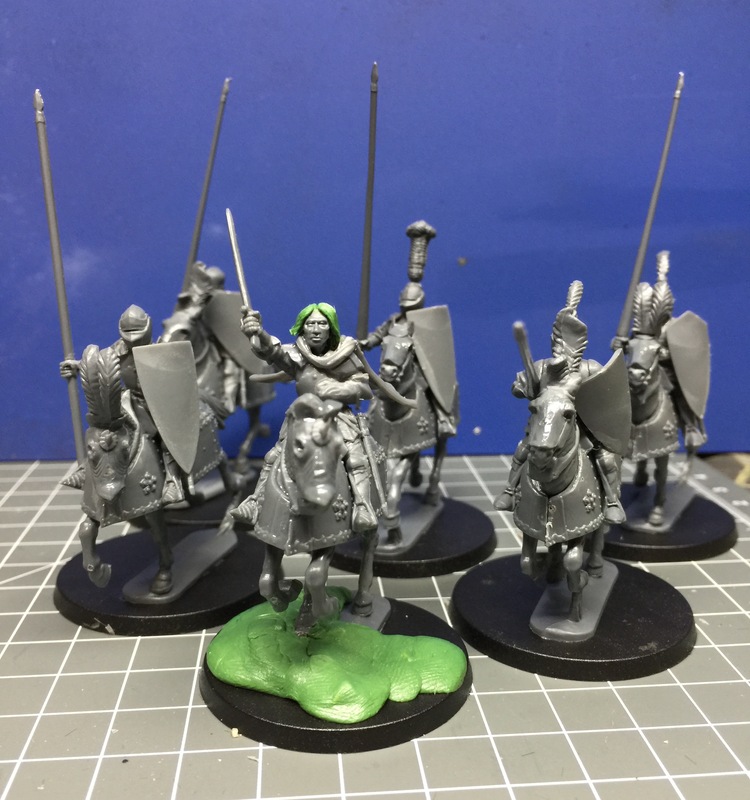 I will post pictures of the painted figures when finished!